You may be a candidate for a total knee replacement if you have failed other treatments for osteoarthritis of the knee. These include no improvement in your symptoms after trying any of the following: physical therapy, unloader knee braces, anti-inflammatory medication, cortisone injections, and/or viscosupplement therapy. Additionally, if your pain is negatively affecting your activities of daily living and keeping you awake at night, you may also be a candidate. In recent years, several new techniques have emerged related to total knee replacements. 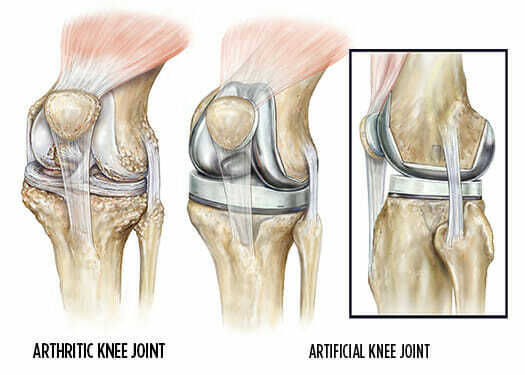 Traditionally, knee replacements have been performed through a long incision on the front of the knee. Recently, “minimally invasive” surgical techniques have become popular among orthopedic specialists. Using these techniques, the quadriceps muscle is spared, the incision is smaller, and the patient may experience less scarring and pain after the procedure. In truth, all knee replacement surgeries have become more “minimally invasive.” As medical knowledge in this area improves, the orthopedic specialists at Summit Orthopedics have become more efficient in their techniques, resulting in better outcomes for our patients. The level of invasiveness of your total knee replacement surgery does not correlate to the size of your scar. The majority of a minimally invasive procedure is done beneath the skin and cannot be seen by superficial examination. The second new development in the world of joint replacement has been the advancement of computers as a surgical tool. During a “computer-assisted total knee replacement,” your specialist utilizes a computer program to map the surfaces of your joint. This ensures a precise fit and alignment of the total knee replacement components. When is total knee replacement surgery recommended? If nonsurgical treatments like medications, physical therapy, injections, and walking supports are not helpful, total knee replacement surgery may be an appropriate option. The surgery is a safe and effective way to relieve pain, correct leg deformity, and help you resume normal activities. There are no age or weight restrictions for total knee replacement surgery. The decision to perform replacement surgery is based on pain and disability. Most patients who undergo total knee replacement are age 50 to 80. Award-winning, advanced surgical facilities Summit Orthopedics’ Vadnais Heights Surgery Center received The Joint Commission’s Advanced Certification for Total Hip and Total Knee Replacement for innovation and patient safety. The center is one of just two nationwide to receive the prestigious certification. Learn more. You must have a pre-op history and physical with your primary care provider within 30 days of surgery. The results should be faxed to the facility where your surgery is scheduled, and you should bring a physical copy of the original form with you to surgery. There are several joint replacement education classes in the Twin Cities area. In these classes, fellow joint replacement candidates gather and learn about what to expect before, during, and after surgery. This is a wonderful opportunity to become more comfortable with this period of transition in your life, and we encourage our patients to participate. Your specialist’s patient coordinator can help you find a class that works with your schedule. Discontinue the use of vitamin E three weeks prior to surgery. Prepare your house for your return after surgery. Simple things like cleaning up any clutter on the floor, clearing space to maneuver a walker, and placing a chair in your shower stall can all help decrease the risk of an accidental fall. Any dental procedures need to be completed at least one month in advance of your surgery. In these types of procedures, bacteria can enter the bloodstream, causing infection and dramatically affecting your chances for a successful outcome. Notify your specialist if you become ill with a cold, fever, congestions, etc. the week prior to surgery. These conditions may require the rescheduling of your surgery. Refrain from smoking after midnight the night before your surgery. Alcohol consumption is prohibited 24 hours prior to surgery. Do not take any acetaminophen, ibuprofen, or other pain medications after midnight the night before your surgery. If you are taking prescription blood thinners such as Coumadin (warfarin), Ticlid (ticlopidine), or Plavix (clopidogrel bisulfate), please inform your specialist’s patient care coordinator. These medications will need to be stopped before the procedure, but only after you receive permission from the physician who is prescribing these medications. A nurse from the hospital or surgery center will contact you 24 hours prior to surgery to tell you at what time your surgery is scheduled and to answer any questions you may have. Arrive at the hospital or surgery center two hours prior to your surgery. During this time, your nurses may run minor tests, check your blood pressure, and take your pulse. Your anesthesiologist will meet with you to discuss the type of anesthesia you will receive. For more information, please refer to the presurgery handout you received. Antibiotics are administered prior to surgery to help protect against any potential infection. During this time, your family may remain with you until you are taken to surgery. A member of your specialist’s team will also come in and address any last-minute questions or concerns you might have. Total knee surgeries can be performed either at a hospital or at the Vadnais Heights Surgery Center or Eagan Surgery Center. Initially you will be placed in a recovery room for several hours so that we can monitor you closely as the anesthesia wears off. During this time, your family will be notified that the surgery is complete and that you are in recovery. After the effects of the anesthesia have subsided and you are medically stable, you will be moved to a hospital or Care Suites room, and your family will be able to visit you. Most joint replacement patients are admitted to the hospital or Care Suites for two to three days. This time frame varies depending on your medical history, overall health, and rate of recovery. During your stay, you will use a constant passive motion machine and participate in physical therapy several times a day. Patients staying in Care Suites are also able to use our Secure Tracks specialty physical therapy device. Contact your specialist immediately if you develop a fever or chills, have pain that is not relieved by medication, excessive unrelenting drainage, calf pain, or if you fall. Call 911 immediately if you experience any shortness of breath or develop chest pain. Once discharged from the hospital or Care Suites, some patients wish to stay in a rehabilitation facility. This allows you to be closely monitored and receive continued physical therapy. If you choose to go home, a physical therapist can visit your home to facilitate your recovery. The decision to go to a rehabilitation facility or return home is based on several factors, and your specialist’s team can help you determine which is the appropriate choice for you. One to two weeks after surgery, your specialist will want to see you in clinic. At this appointment, you can expect to have any remaining staples removed, take X-rays, and receive instructions and guidelines for the next four to six weeks. Your specialist will provide you with physical therapy orders and can write a referral to a physical therapy clinic if you need it. It is important to have realistic expectations about your knee replacement surgery. Although they are rare, there are potential complications with any surgery, and you are expected to have reasonable understanding of the risks. Please refer to our preoperative informational handout for further information regarding potential complications and risks associated with surgery. Do not hesitate to discuss concerns with your specialist at any time, including the possibility of your surgery not having the desired outcome. The purpose of this information is to inform and ease any reservations you may have regarding surgery. This sheet should be thought of as educational and read with the understanding that any information your orthopedic specialist provides you overrides the information covered here. The National Institutes of Health identifies total knee replacement preoperative education as one of the main factors in increasing your chances of a positive outcome. Our goal at Summit Orthopedics is to assist you in this regard and help you have the best experience possible as you transition into this new phase of your life. Should you have any questions or concerns, do not hesitate to contact your specialist’s team. They are available to help you and address any questions or concerns that you may have.